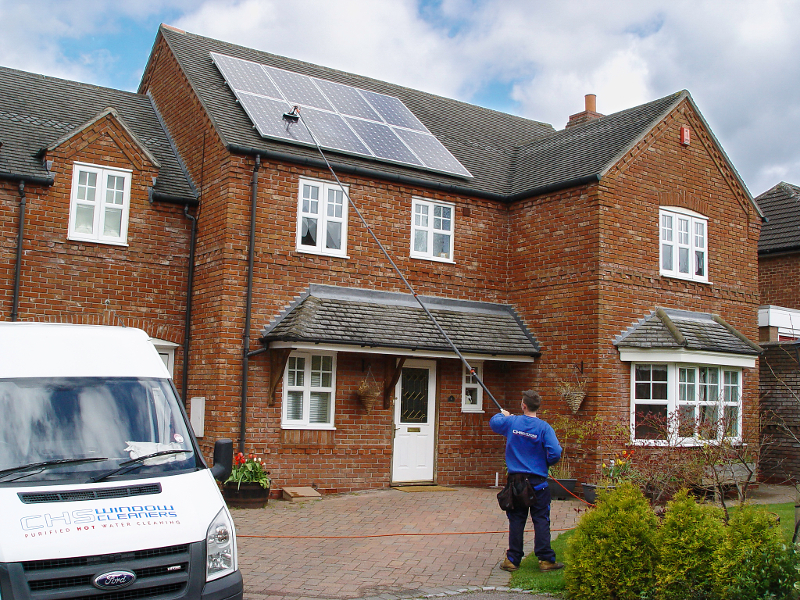 CHS solar panel cleaning services are available in the Lichfield, Shenstone, Sutton coldfield and surrounding areas. Nowadays a lot of residential and business properties are realising the benefit of, and investing in, solar energy. After making such a large investment in solar panels it is essential to keep them running at their optimum performance. This is achieved with a regular cleaning schedule. Manufacturers recommend cleaning of the panels once to twice a year to keep them running at their optimum levels and also to prolong the life of the panels themselves. If it has been some time since the panels have been cleaned, it could increase their performance by up to 50%. With the panels being so exposed to the elements, they do tend to collect a lot of debris, dirt, pollution etc, and as this settles slowly algae starts to build, and when the sun does shine, not only is it harder for the sun to penetrate through the dirt, it also bakes the dirt on creating a cycle of ever-decreasing performance. Of course there has to be a balance between maintenance costs and the savings that the panels are bringing, and to find this balance, the panels need to be able to be cleaned in an efficient manner. We find the method we use is the most cost effective solution to keep your investment returning year on year, and as all the work is carried out at ground level, it eliminates the potential damage to the property that may occur using other access methods, whilst fully complying with the “working at height legislation 2005”. 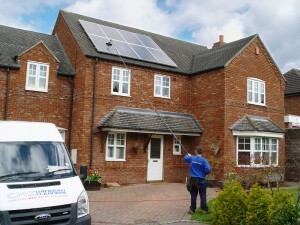 Call us today for a free no obligation quote for all your solar panel cleaning requirements. You may be surprised at how affordable this service can be.